A new update also brings the app to Google's Chrome Web Store. Users of Microsoft's new Sway presentation app can now rest easier knowing their work won't get accidentally deleted, thanks to a set of new features the company released Friday. When people go and delete a Sway that they're working on, it's sent to the service's Recycle Bin, where it can be recovered for 30 days, rather than disappearing forever right off the bat. It's good news for people who put hours of work into creating presentations using Sway, only to have them disappear in the blink of an eye when users clicked or tapped the wrong button. People who are sure that they want to delete things in the Recycle Bin can choose the Empty Recycle Bin button to permanently delete all of the Sways that are on the chopping block. People who use Chromebooks and Office 365 also have an easier way of getting access to Sway, which is now available from the Chrome Web Store. That makes it easier for Chrome OS users to get access to Sway Online from their Chrome browser homepage and the Chromebook launcher, and is particularly valuable for educators and students who use Google's operating system but have access to Office 365 through their institution. Microsoft also made it easier for folks who are already tied into its Office ecosystem to create Sway presentations with a new beta Add-in for the PC version of OneNote that automatically generates a Sway based on a OneNote page. All users have to do is click a button in OneNote, and Sway will generate a presentation for them based on the content of their notes. It's an interesting competitive move that puts Sway and OneNote on par with Evernote, which also supports creating a presentation from a note or group of notes. 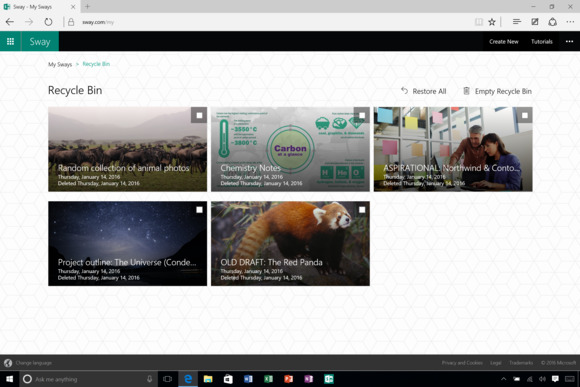 Sway for Windows 10 also now supports dragging and dropping images from the file explorer into a presentation. It's a feature that makes it easier for users to take pictures that they've found online or shot themselves and turn them into a part of the presentation that they're building. The app also now supports natively viewing presentations in full screen, something that previously required people to use a browser that's capable of entering full screen mode. The updates come a few months after Microsoft made Sway generally available as part of Office 2016. It's an app that's designed to create interactive, Web-friendly presentations, without all of the complexity packed into PowerPoint.